Todos somos Proyecto Jardin. Contributing writer Susana Sandoval. For the last 15 years, Proyecto Jardín, a community garden project that took root as the result of one physician’s determination to see something beautiful in place of a vacant, neglected parcel of land within eyeshot of his office at White Memorial Medical Center, has stewarded the one-acre farm, outdoor classroom, playground, meditation center, nutritional health resource and public art showcase. Dr. Rob Krochmal, the medical resident who looked out from his office window, imagined a tranquil, beautiful, well-tended greenspace where neighbors from the surrounding Boyle Heights community could garden, heal, exercise, and learn as part of an “Integrative Wellness” approach he still champions today, according to his website. As the grandson of a doctor who was one of the last physicians to make house calls on the East Coast, he initiated discussions between hospital administrators and local community gardeners, crafters, artists and advocates in an effort to realize the vision. Together they drafted a 15-year lease agreement that, for a symbolic $1 a year in rent, effectively granted community members the responsibility for transforming the void, owned by White Memorial and its parent, the Seventh Day Adventist Church, into the resplendent, blooming sanctuary of health and beauty it has become. Unfortunately, after having created a community space that “cultivates and promotes community health and wellness, social cohesion, cultural self-determination, and grassroots people power through urban agriculture, traditional healing arts, artistic expression, and community organizing,” Proyecto Jardín--recognized by the Alliance for California Traditional Arts as a “Boyle Heights Treasure”--now faces imminent eviction from the garden. White Memorial Medical Center, in written correspondence, has made it clear that Proyecto Jardín is no longer a welcome steward, despite the beloved community organization’s best efforts to arrive at a negotiated “win-win resolution” with support of garden allies and the most relevant stakeholders. Hospital representatives have stated that the vision for the garden as developed by actual community stakeholders through Proyecto Jardín no longer coincides with their, as yet mysterious, unrevealed and still forthcoming plans for the future of the garden or how, in their top-down estimation, it should be operated and administered. According to Proyecto Jardín director Irene Peña, White Memorial offered a six-month lease extension in December 2015 that would effectively wrest primary oversight of the garden away from the organization, limit their use of the garden to only 1/3 of the existing space, install their own Marketing Department offices and facilities, re-brand and rename the garden completely and invite two as yet unnamed “community organizations” to replace Proyecto Jardín as the liaisons to local urban farmer members who have worked the existing plots to cultivate food and herbs for harvest. When Proyecto Jardín and its assigns could not, in all good conscience, agree to sign the lease extension agreement sent on December 10th and offered a compromise counter-proposal which they hoped would lead to further lease renewal negotiations, they were abruptly served with a notice from Phillip de la Torre, general manager at Jones Lang Lasalle, a property agent for White Memorial, that their tenancy was being terminated. The letter went on to stipulate that they had 30 days to vacate the premises. While not commonly known, Jones Lang Lasalle, a property manager and rental property speculator corporation, has become profitable based on its ability to predict the upswing in urban, inner-city property values nationwide as gentrification converts formerly marginalized and neglected ethnic neighborhoods into trendy and desirable enclaves. They specialize, according to real estate industry insiders, in attracting wealthy, white professionals who have grown weary of long commutes from outlying suburbs to jobs in central city cores. The downside to this and other projects that have made companies such as Jones Lang Lasalle successful is the displacement of long-time residents, businesses and organizations that serve them. Consuelo Velasco Montoya, an Otis College of Art & Design professor, a community resident and an artist, sees the unfolding of events as damaging to the relationship between the healthcare institution and the community. On one hand, she says, the $1 a year original lease was “an incredible blessing to the LADRA [Los Angeles Department of Relief Agency]” because it added to food sustainability and supported lower income families by allowing them to grow their own food. “The concern with the development of any public space,” she says, “is always the maintenance of the project and creating a community plan with stakeholders, which has been the basis for all Proyecto Jardín programming.” The funding from two grants procured independently by Proyecto Jardin initially was invested, for example, in the garden's sculptured metal entrance and the landscaping of the garden, thus showing respect for the community stakeholder input vis-a-vis the garden as a built environment. Daisy Tonantzin, a self-described urban farmer and creator of the Yerberia Mayahuel line of natural health, beauty and skin care products, was involved from the very beginning. She, alongside volunteers and leaders at organizations such as Girls Today, Women Tomorrow, were part of the original landscape development of a series of four planters, each in the shape of a caracol and representing each one of the four elements and one of the four cardinal directions. “I came to Proyecto Jardín as a new mom wanting to learn how to grow my own food, conducting cultivating roots workshops [that] focused on a different herb every week and left a small business owner and co-founder of Caracol Marketplace,” says Tonantzin. Caracol Marketplace, a woman-led artisan market which honors indigenous identity, is now “eleven years strong,” Tonantzin says proudly. 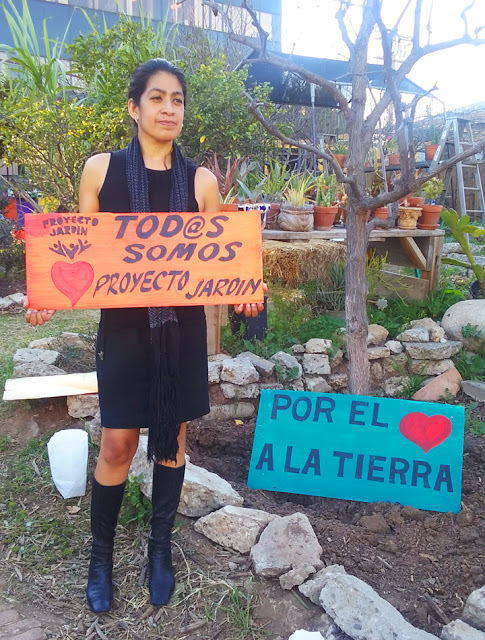 Both Velasco Montoya and Tonantzin are among a groundswell of volunteers who have come together in an effort to protect the autonomy of Proyecto Jardín as part of a legal response with assistance from attorney Elena Popp, founder of the Eviction Defense Network. The self-styled Garden Guardians have come from all over Los Angeles and represent a rainbow of ethnicities. Tents and potluck meals are shared among those who commit to overnight stays, and a dry-erase chalkboard with a weekly schedule allows volunteers to sign themselves up for Guardian duty rotation. Whether or not White Memorial is willing to return to the table for honest, sincere dialogue that honors the value that Proyecto Jardín has imbued to the modest one-acre plot at the corner of Bridge and Boyle Streets remains to be seen, says Velasco Montoya. From her perspective as the child and grandchild of farmers herself, Proyecto Jardín is the only legitimate representative of the community White Memorial claims to serve and deserves a chance to build upon the fifteen-year community garden tradition it has created against all odds.